You are here: Home » What t-shirts are you wearing? Custom-imprinted apparel is something we deal with all the time here at Jag, but it can be a tricky thing to tackle sometimes. If you’re looking for something simple – a polo embroidered with your corporate logo – it’s no big deal. But oftentimes, people want t-shirts that speak volumes. They want t-shirts that people are willing to wear in public, over and over again. Often, they want t-shirts people are willing to pay money for (either as a fundraiser or a for-profit endeavor). Which begs the question … what’s in your t-shirt drawer? It turns out that the imprinted T-shirts that you keep and wear can tell a lot about your life, your interests and your priorities. 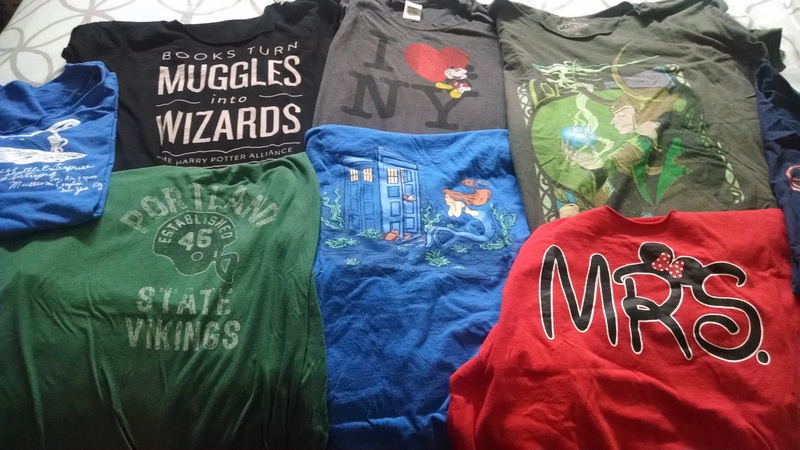 The majority of my imprinted tshirts are from fandoms I love: Harry Potter, Doctor Who, Marvel, Disney, etc. I am a nerd, and a fandom girl and I like shouting to the world about the things I love. There are a lot of tshirts from vacations (mostly from Disney theme parks, but also places like New York City). I have a few band t-shirts from concerts I’ve attended (more souvenirs), and a couple of college t-shirts — both from my own school, as well as the schools of family members and friends. The one common element these tshirts share is aesthetics: I only buy, keep, and wear the tshirts that have a good design. I like the way these ones look, I like the design, and I want to show them off. It’s interesting to note, however, that I favor some shirts more than others not because of design – but because of fit and comfort. For example, as much as I adore my Karen Hallion-designed Doctor Who/Little Mermaid crossover tshirt (center, bottom row in photo above) – I don’t wear it often, because the shirt itself isn’t my favorite fit and style. But I wear my Harry Potter-inspired “Books Turn Muggles into Wizards” tshirt all the time, because I love the design AND it’s one of my most comfortable shirts. These are all important things to keep in mind the next time you order custom imprinted t-shirts: what do they look like, how do they fit/feel, and will people wear them – again and again and again?